GreenClick LED Luna Moon Lamp Review BackyardToolshed - All your tool needs in one place! A moon lamp should be two things: beautiful and functional. It’s a wonderful accessory to a console table or a magical night light for your bedroom. The LED Luna Moon Lamp from the company GreenClickGlobal is a 3D Printed Moon Lamp. The name “Luna” certainly is a fitting, and lovely name for a moon lamp, isn’t it? The word Luna is Latin, meaning moon. It’s also the name of the Roman goddess of the moon or Selene in Greek mythology. 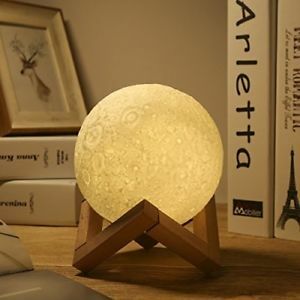 So it’s not a surprise that having this 3D moon lamp is like having the moon in your room. Made with innovative 3D printing technology, the Luna Moon Lamp is carefully stacked by layer in order to achieve the true appearance of the moon itself. The 3D printing technology helps bring out texture as close to the moon’s surface. The Luna Moon Lamp measures 5.1 inches in diameter, making it an adorable piece that you could hold in your hands. But doesn’t mean that it’s relatively small that it won’t work as a great decorative piece. It comes with a wooden base and a 4-foot string along with a small hook so you could either choose to prop it on its mount or hang it somewhere. If you do think about hanging it, above your bed or by the window are excellent places to do so. The Luna Moon Lamp uses an LED bulb at 0.5 watts with a battery capacity of 1200 mAh. It comes with a rechargeable battery so you could use it outdoors or without being plugged in. When it comes to charging the moon lamp, you can use the USB cable that it comes with. Just use an appropriate adapter or plug it in your charging hub or even your computer. Charging would take about 4 to 5 hours that would result to between 8 and 30 hours of use. Knowing when to charge and when it’s finished is easy because of its smart charging design. A green light will show at the bottom of your moon lamp that lets you know if its power is lower than 10%. Plugging in your moon lamp will turn the green light to a red light and when that red light turns off, that means it’s fully charged. Knowing this is especially important since taking care of your moon lamp’s battery will help prolong its lifespan. Brilliantly designed, the Luna Moon Lamp offers two modes of use which makes it completely “touch-controlled”. With a switch of the white button, you activate its AUTO mode. This AUTO mode allows you to adjust the Luna Moon Lamp’s brightness to 100% bright, 50% bright and off cycling with a simple touch. The other mode is ON, which you activate by switching the white button again and then click a black button. This time it will swap to color changing mode where you can enjoy the colors shifting from white to warm yellow and light yellow. If the brightness is too much or too little for your preference, press the black button again. With all these wonderful features plus the fact that it’s made of completely environmentally-friendly PVC + ABC material, The Luna Moon Lamp is surely a lamp that’s here to impress.